The performance of connections between prefabricated concrete elements constructed using field-cast cementitious grouts and grout-like materials is becoming a focus area for accelerated bridge construction (ABC) projects. These connections are required to provide sufficient strength and long-term performance equal to or better than the adjacent concrete elements that they are connecting to assure adequate stress transfer and long-term performance throughout the life of the bridge. Many aspects need to be taken into consideration when specifying the material to make these connections. This TechNote focuses on the aspects related to the bonding interface between the previously cast concrete element and the field-cast connection grouts, including test methods, factors affecting bond, and best practices for detailing and construction. In recent years, ABC has become increasingly popular for both new and replacement bridge construction throughout the United States. ABC projects typically use innovative planning strategies, novel materials, and innovative structural designs to expedite completion and reduce the onsite impacts of bridge construction. (1) Many ABC projects use prefabricated bridge elements (PBEs). These elements are typically produced under controlled environmental conditions either off or near site and can offer improvements in quality and the expectation of better long-term performance. Once fabricated, PBEs are delivered and rapidly assembled. 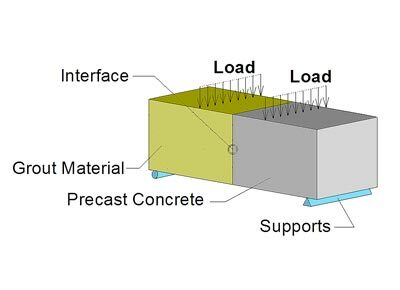 To create structural continuity, PBEs are typically connected using interlaced reinforcing bars and field-cast grout closure pours (see figure 1). The ideal closure material for PBE connections is self-consolidating; has high early-age strength; and offers exceptional durability, dimensional stability, and a bond that is stronger than the tensile capacity of the element to which it is connected. The most common connection grouts are cement-based, low-shrinkage grouts that are commonly referred to as “non-shrink” cementitious grouts. However, other grout materials have recently emerged as alternatives. Examples include epoxy-based grouts, ultra-high performance concretes (UHPCs), and grouts that employ alternative binder systems (e.g., micro-silica) with or without the use of fiber reinforcements. precast concrete bridge deck panel elements. Design, detailing, and proper material specification of field-cast grouts are critical for a number of reasons. First, connections typically coincide with regions expected to experience high force demands and must be resilient against repeated load cycles. Second, connection interfaces between the prefabricated concrete elements and the field-cast closure grouts are unavoidable, which can result in premature debonding at the concrete-grout interface. 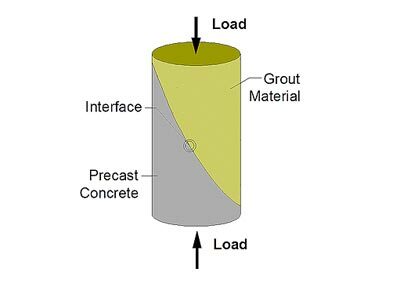 Thus, the closure grout material must not only be able to transfer structural loads between the adjacent elements, but it must also be able to bond well at the precast concrete interface. Local behaviors occurring between the substrate concrete and the field-cast material are central to this document. Herein, the cold joint between the previously cast concrete and the field-cast connection grout is referred to as “interface” or “concrete-grout interface.” Furthermore, the term “bond” refers to the chemical and/or mechanical connection at the grout-concrete interface. The primary performance objective of PBE connections is to achieve, at a minimum, behavior and performance equal to or better than that of the components being connected. Cold joints between precast concrete and field-cast connection grouts are susceptible to premature cracking as a result of bond failure. Thus, a good bond between precast concrete and the connection grout is important. Prevention of premature interface cracking prevents salt and other contaminants from infiltrating connections. This is important because the infiltration of such materials can cause premature material degradation and corrosion of reinforcing bars, thus decreasing both the durability and service life of the structural element and the structure as a whole. In general, if cracking is to occur, the design objective should dictate that cracks from within the precast concrete elements and not at the concrete-grout interface. Bond between existing and fresh cement-based materials is a topic that has been researched in the past. (2, 3) However, despite a relatively large body of knowledge, practical issues related to achieving long-lasting bond in PBE connections are still inadequately addressed. Previous studies on bond have focused on bond between existing concrete and repair materials and not bond in PBE connections. Although there are some similarities between the two cases, there are significant differences that require studying bond in the context of PBE connections separately. Understanding the factors that affect bond behavior between precast concrete and PBE connection grouts is critical for proper design and detailing of connections. Previous research identified several of these factors. (3–5) Of equal importance is the test methods used to evaluate the bond strength. Both of these topics are discussed in subsequent sections. The research performed at Turner-Fairbank Highway Research Center (TFHRC) has focused on addressing some of the questions related to the proper selection and execution of the most appropriate bond test methods to use for PBE connections. Four different test methods were investigated (see figure 2 through figure 5). Each test is based on an existing ASTM standard test method and may have been modified from its original purpose to study bond strength for PBE applications. Although a number of different test methods exist, these four were selected because they can be easily conducted in most State transportation department material laboratories and because they attempt to replicate stress states that could occur at the interface in PBE connections. between precast concrete and field-cast connection grouts. Figure 5. Illustration. 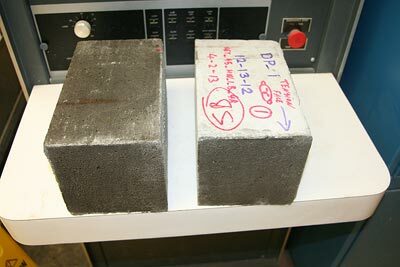 Direct tension pull-off test for characterizing bond between precast concrete and field-cast connection grouts. Recognition of interface stress state: Both the fabrication of test specimens and the execution of the test method generate stresses on the interface. Fabrication-related stresses (e.g., shear strain due to shrinkage of secondary cast material) may affect the interface bond and could vary depending on the geometry of the specimen and/or the curing conditions. Test methods commonly induce complex stress states into test specimens (e.g., compression/shear in a slant cylinder test); the primary and secondary effects of these stress states must be recognized in the context of the response that is being assessed. Documentation of peak load at or before interface failure: Each of these tests requires the peak load at or prior to failure to be recorded. This load is used to determine the peak bond stress observed during the test. This stress may be the bond strength if interface bond failure occurred. Documentation of failure mode: The type of failure, whether related to interface bond or to an artifact of the test method, must be documented. 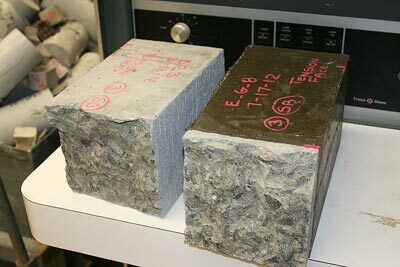 For instance, a slant shear test could result in a compression failure of the substrate concrete; this result would not be indicative of the compression/shear bond strength of the interface. In the context of interface bond failures, three primary failure locations are observed (see figure 6 through figure 8). The identification of failure location is important because a user may want to use this parameter as an acceptance criterion for a given sample. Calculation of bond strength: Once tests have been completed and the results have been sorted to include only those relevant to the overall assessment, the bond strength at a particular stress state (based on test method used) can be calculated. Using the tests shown in figure 2 through figure 5, bond strength can be calculated using equations provided in each respective test method. The bond strength is commonly calculated as the average of multiple samples. 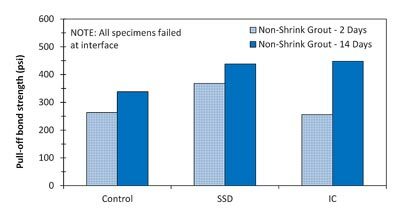 It is important to recognize that the result from a specimen that did not fail at the bonding interface (e.g., a pull-off test that failed in the substrate concrete) will represent interface bond stress at specimen failure, not the bond strength of the interface. bond failure at the interface. Flexural beam bond tests can be conducted using the specimen geometry and loading protocols described in ASTM C78, Standard Test Method for Flexural Strength of Concrete (Using Simple Beam with Third-Point Loading). (7) This test puts a portion of the interface into a state of flexural tension. Specimens are constructed by first casting a concrete half-beam. Once the concrete half-beam has cured and the substrate surface has been prepared, the remaining beam half can be cast using the connection grout material in question. Research has demonstrated that this test method can be used to compare different grout materials with different concrete substrate surface preparations for bond improvement. (8) However, in some cases where the bond between the two materials is not strong enough (e.g., poor surface preparation), specimens fail during handling prior to loading. When this occurs, specimens typically exhibit bond failure at the interface. Bond strength can also be measured with cylindrical specimens tested in accordance with ASTM C496, Standard Test Method for Splitting Tensile Strength of Cylindrical Concrete Specimens. (9) This test puts the interface into a state of indirect tension. Again, specimens consist of a precast concrete half and a grout half. The final geometry of specimens can use standard 4- by 8-inch (101.6- by 203.2-mm) or 6- by 12-inch (152.4- by 304.8-mm) cylinder molds. Similar to flexural beam bond tests, splitting cylinder specimens have been observed to exhibit failures at the three locations identified in figure 6 through figure 8. Ongoing research at TFHRC has demonstrated that this test is an easy way to measure the bond strength of a concrete substrate to different grout-like materials. However, it has also shown deficiencies in the proper evaluation of other parameters that affect bond (e.g., surface preparation) because the results do not show significant differences. It also must be recognized that differences in elastic moduli between the substrate and the secondary cast materials can induce unanticipated strains and stresses into the specimen. The pull-off test method is based on ASTM C1583, Standard Test Method for Tensile Strength of Concrete Surfaces and the Bond Strength or Tensile Strength of Concrete Repair and Overlay Materials by Direct Tension (Pull-Off Method). (13) The test can be performed either in situ or on a prepared sample; however, an in-situ test requires the repair of the tested location. As the name implies, this test method puts the interface into a state of pure tension. The test specimen is formed by partially drilling a shallow core perpendicular to the interface. Finally, a tensile load is applied to a steel disc that was previously bonded to the top surface of the test specimen. Figure 9 and figure 10 depict a comparison of three test methods that aim to assess tensile bond strength (i.e., flexural beam, split cylinder, and direct tension pull-off). This comparison only identifies the differences in apparent tensile bond strength and does not take into account other factors such as concomitant stress states that could affect the apparent tensile bond strength result. For a given comparison plot, each data point reflects the average bond strength as measured by two different tests for a given set of test variables; variables might include grout age, concrete surface preparation, and/or type of bonded grout material. In general, these plots identify how multiple tests, each purporting to deliver a tensile bond strength, can in fact provide a different result. 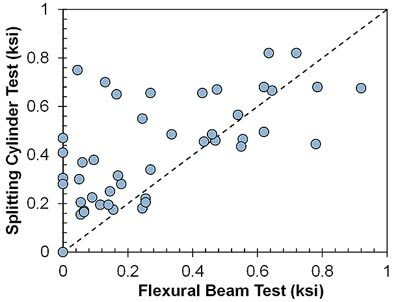 Based on the data shown here, it can be observed that the flexure beam test and the splitting cylinder test each relate higher bond strengths than the pull-off test. This is attributed to the different stress states occurring in the different test configurations and the fact that some stress states serve to delay bond failure, thus delivering a non-conservative indication of the tensile interface bond strength. 1 ksi = 6.9 MPa. apparent bond strength—flexural beam and splitting tensile tests. apparent bond strength—flexural beam and direct tension pull-off tests. Research carried out at TFHRC has demonstrated that bond can be significantly improved by exposing the aggregate within precast concrete at the concrete-grout interface. 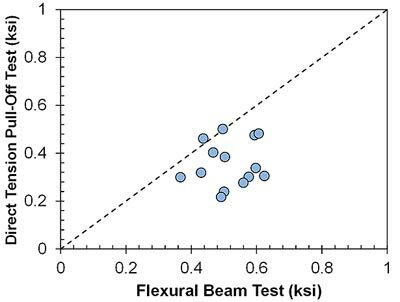 Figure 11 shows results from flexural beam bond testing using different precast concrete surface preparations and different grout materials. 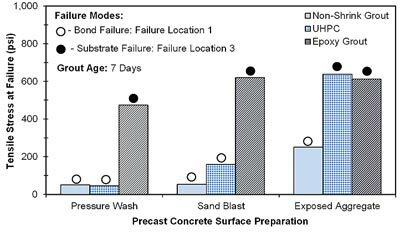 The surface preparation methods were selected based on their applicability in PBE connections, yielding different concrete surface roughness (see figure 12 through figure 14). Although different failure modes were observed, use of precast concrete with exposed aggregate surfaces leads to higher flexural bond strengths compared with other surface preparation methods applicable to precast concrete elements. 1 psi = 0.007 MPa. Figure 11. Graph. Average tensile strength from flexural beam bond tests. Figure 12. Photo. 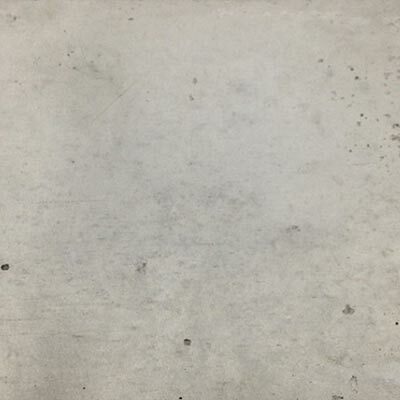 Example of a pressure-washed concrete surface. Figure 13. Photo. Example of a sandblasted concrete surface. Figure 14. Photo. 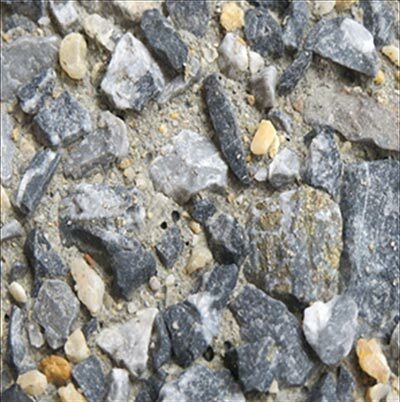 Example of an exposed aggregate concrete surface. 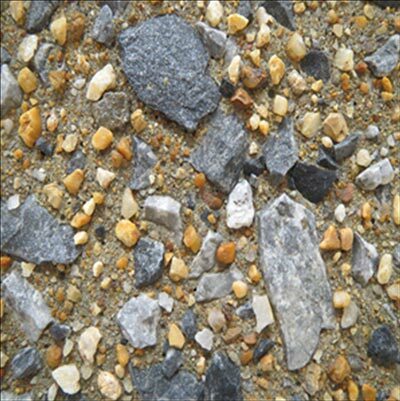 Exposed aggregate surfaces are typically created using in-form retarders, which are pressure washed after form removal to expose the aggregate. Using these retarders, it is possible to achieve different levels (or depths) of aggregate exposure depending on the type of retarder used. Levels of exposure can range from very low, which would be similar to a sandblasted finish, to high, where the coarse aggregate would be very apparent. Figure 15 through figure 17 show three different levels of exposure where three different in-form retarders were used. In this case, each exposure level reveals different degrees of fine and coarse aggregate. For example, smaller coarse aggregates can be observed in the low exposure level, whereas the larger coarse aggregates can be seen in the high exposure level. The difference among the three retarder systems is the concentration of the retarder. As previously noted, increasing surface roughness typically results in increased bond strength. Thus, the different exposure levels produce different bond strengths for different materials. This effect can be observed in figure 18, which shows that the tensile bond strength of a conventional non-shrink cementitious grout increased by increasing the depth of etch on the exposed surface of the concrete substrate. It is interesting to note that, in the case of UHPC, high-tensile bond strength is achieved without the need for a high level of substrate surface roughness (i.e., high aggregate exposure). This is indicative of the influence of other parameters that might play a more important role than surface roughness in enhancing bond (e.g., grout fineness, grout consolidation, etc. ), at least for this material. Figure 15. Photo. Example of a low coarse aggregate exposure level. Figure 16. Photo. Example of a medium coarse aggregate exposure level. grout and UHPC as a function of aggregate exposure level. After preparing the concrete surface using any of the methods described earlier, it is becoming a common practice to moisten the concrete surface with water prior to the grout pour. The moisture content in the concrete substrate is known to affect bond strength, and the impact can be either negative or positive. When fresh grout material is cast against a concrete substrate surface that lacks moisture, moisture is absorbed (transferred) from the fresh grout material into the substrate. In this case, the moisture comes from the mixing water that the fresh grout material requires for hydration and strength-gain. Water migration from the fresh grout material can also increase local shrinkage near the interface between the two materials. This will induce tensile stresses at the interface and can cause microcracking and reduced bond strength. Research has shown that different substrates and grout materials may require different interface moisture conditions at the time of casting to achieve optimum interfacial bond. (15,16) One challenge is that there is no test method for determining the optimum concrete substrate moisture condition for a given grout type or a specification that can be used in the field to instruct contractors on the proper substrate condition needed. On one hand, an excess of free water at the interface can increase the water-to-cementitious ratio of the grout, thus reducing the material strength and possibly the bond strength. On the other hand, a concrete surface that is too dry can absorb water from the grout, resulting in the aforementioned problems. Thus, the so-called saturated surface dry (SSD) moisture condition is sometimes specified for the substrate concrete at bonding interfaces. This moisture condition provides enough moisture to saturate the capillary pores of the concrete surface (so that moisture transfer does not occur from the grout) while at the same time preventing the formation of a layer of free water at the interface. Spraying water on concrete substrate immediately before grout casting. 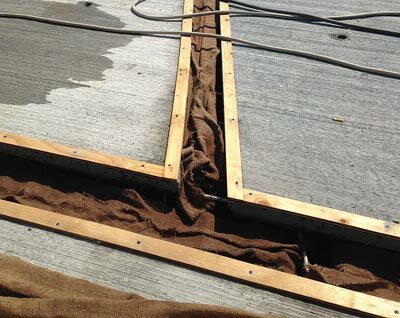 Keeping the substrate surface saturated by placing wet burlap on the surface for about 2–3 h.
Achieving an SSD condition by ponding water for a 24-h period and drying the surface with a paper towel right before the grout casting. Figure 19 shows the pull-off test results of a UHPC overlay cast over a concrete slab with exposed aggregate surface. Both wet burlap and SSD conditions enhance the tensile bond strength to the point that the failure occurred at the substrate rather than at the interface, as indicated by the concrete substrate tensile strength. direct tension pull-off bond strength of UHPC. The burlap approach can be implemented in the field in some types of PBE connections; various State agencies are currently using this type of pre-moistening technique. Figure 20 depicts a method that has been used in the field to pre-wet the connection prior to casting cementitious connection grouts. Burlap sheets were placed on top of the connection between adjacent prefabricated bridge deck elements. A few hours before the closure grouting operations began, these sheets were installed and kept saturated with water to promote a moist environment within the connections. Figure 20. Photo. Provision of extra moisture in PBE connections. Just as structural steel requires specific interface surface preparations prior to paint application, substrate concrete requires a clean surface prior to grout casting. A surface that is contaminated at the time of grout placement can result in reduced bond strength. Loose particles have been shown to inhibit bonding, thus reducing the bond strength. (2) Avoidance or removal of any chemical debonding agent or contaminant (e.g., oil) is of upmost importance. Precast concrete connection surfaces should be prepared by removing grit and/or loose particles prior to placement of connections grouts. Examples of cleaning procedures include pressure washing or air blasting. Care must be taken not to damage the precast surface or any protruding connectors such as epoxy-coated steel reinforcements. 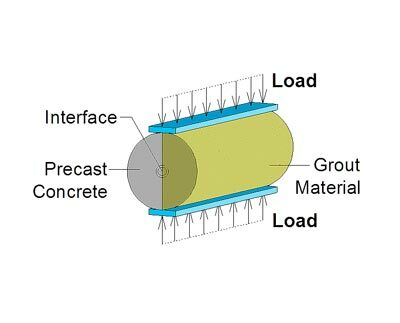 Differential movement of the precast elements can degrade the ability of the grout to bond to the substrate. Maintaining stable precast elements during grouting and grout curing operations is important. Limiting loads on the structure mitigates structural deformations and allows bonding to occur. For staged construction where portions of the structure remain open to traffic, it is important to mitigate differential movements within precast element connections by taking actions such as limiting truck traffic or limiting load distribution from the loaded portion of the structure into the freshly constructed portion. Good flowability mainly refers to the capability of the fresh grout material to consolidate and ensure a good contact and uniform bond between the grout and the substrate. This is important especially where rough surfaces are present to prevent the development of air pockets in the valleys of the surface texture. In other words, the higher the consolidation is (i.e., fresh workability), the greater the ability to bond at the contact area between the two materials. In addition, the size gradation of the solid particles in the premixed grout can play an important role in how well the fresh grout material consolidates. The solid fraction of a grout can consist of many different materials of different sizes, such as cement and/or any other inert (e.g., finely ground silica) or amorphous (e.g., silica fume) particles. Similarly to the cement paste-to-aggregate interface in conventional concrete, a wall effect exists at the grout-concrete substrate interface when the two materials are placed in contact. The wall effect is due to the lower packing efficiency of the grout particles at the vicinity of the concrete surface. As a result, an interfacial transition layer is created where the porosity tends to be greater than in the bulk of the grout material, thus creating a layer of weakness. (17) This is the reason a fine and continuous grout particle size gradation (i.e., particles of different sizes) is a key factor in reducing the thickness of the interfacial transition layer. For instance, UHPC materials provide a wide range of very fine particles sizes, which is expected to positively contribute in the bond performance of these types of materials. Dimensional instability (i.e., expansion or more commonly shrinkage) of the grout can lead to poor performance of the grout, the interface, and/or the surrounding substrate concrete. Dimensional incompatibilities between the grout and the substrate can cause the development of stresses within the grout material or the substrate, leading to premature cracking, or can cause stresses at the interface leading to loss of bond between the grout and the substrate. It is desirable that shrinkage of the grout be minimized and occur before the material reaches final set so that the likelihood of good bond can be increased. Likewise, proper curing of the grout is crucial because poor curing can lead to evaporation and drying during hydration of the grout and an increased likelihood of shrinkage cracking. Good curing procedures prevent moisture loss during the hydration of the grout and often decrease the likelihood of cracking and can translate into higher strength and better durability. An extensive dimensional stability study was performed at TFHRC using grout-like materials for PBE connections. (18) The study showed that most conventional, non-shrink grouts undergo considerable autogenous and drying shrinkage, as shown in figure 21. These volume changes that occur as the material hardens may have a negative effect on the bond performance of these grouts. In that study, some of the cementitious grouts included internal curing (IC) through the addition of pre-wetted fine lightweight aggregates. This is proposed as a method to reduce part of the autogenous (sealed) and drying shrinkage (see figure 21) with potential improvement in the bond performance. As observed, both autogenous and drying shrinkage are considerably reduced in the IC specimens. This has been shown to be a result of the internal relative humidity in these specimens being maintained at higher levels, which directly reduces both internal (autogenous) and external drying effects. (19) IC simplifies the efforts that are needed to provide adequate curing conditions in the field for grouts poured in confined locations or at locations that make access for external (or conventional) curing difficult. Preliminary pull-off bond results obtained from a grout-concrete slab where the concrete surface was treated with an in-form retarder to expose the coarse aggregate fraction are shown in figure 22. The grout specimen was prepared in three different conditions: (1) “control,” where the grout was poured over a dry concrete surface, (2) “SSD,” where the grout was poured over an SSD concrete surface, and (3) “IC,” where IC was included in the grout and poured over a dry concrete surface. 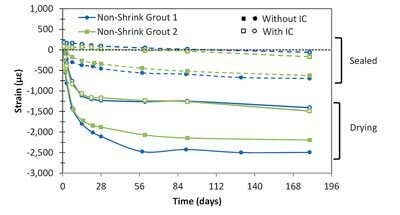 The results show increased tensile bond strength when IC was included in the grout (see figure 22), although it may take a few days until the IC effect is visible. two non-shrink cementitious grouts with and without IC. Figure 22. Graph. Effect of IC on the bond strength of a non-shrink cementitious grout. As in the case of the grout material, the tensile properties of the concrete substrate are important for improving the grout-concrete bond strength. A strong concrete substrate strengthens the vicinity of the grout-concrete interface on the concrete side. This is typically achieved by decreasing the water-to-cement ratio (w/c) in the concrete mix design. In addition, the absorption capacity of a low w/c concrete is lower than that of a higher w/c concrete, thus theoretically reducing the water migration from the grout material into the concrete substrate, which might negatively affect the bond performance (as previously mentioned). Therefore, it is important to know not only the tensile properties of the concrete substrate but also its absorption capacity. Regarding dimensional stability, the concrete substrate is usually relatively stable, with minimal residual creep and shrinkage. However, it may sometimes experience some volume instability (thermal expansions and contractions due to environmental changes) that might affect the bond between the grout and the concrete. In this case, compatibility of thermal expansion/contraction between the grout and the substrate is advantageous. For highly fluid mixtures such as grout-like materials, the use of bonding agents might be less necessary than for cases where stiffer mixtures are used, mainly as a result of the capability of the grout to fill the cavities and voids of the substrate, increasing the effective contact area. 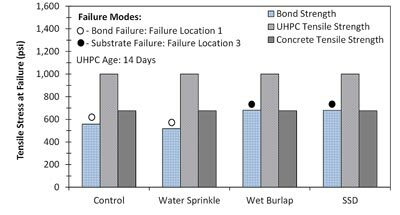 (15) Research at TFHRC on latex-based bonding agents has not found beneficial increases in the grout-concrete interface bond strength. The grout should have shown a history of good bond performance. The grout should have demonstrated good bond performance when assessed according to a relevant standardized interface bond test. Barring knowledge related to either of the aforementioned criteria, grouts possessing properties that tend to promote bond, such as dimensional stability, durability, and strength, should be used. Special attention should be given to dimensional stability, focusing on materials that exhibit comparatively little time-dependent expansion or shrinkage. 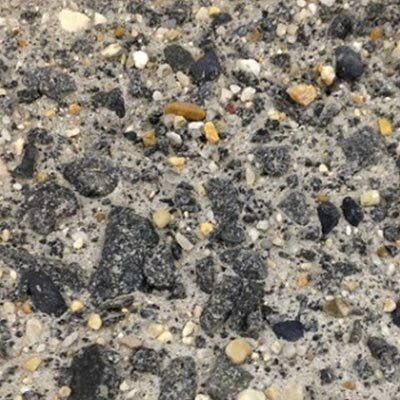 Concrete surface finish: Surfaces of prefabricated concrete elements that will be in contact with connection grout materials should have an exposed aggregate finish. This finish should resemble those shown in figure 6. That is, portions of the coarse aggregate should be visible. 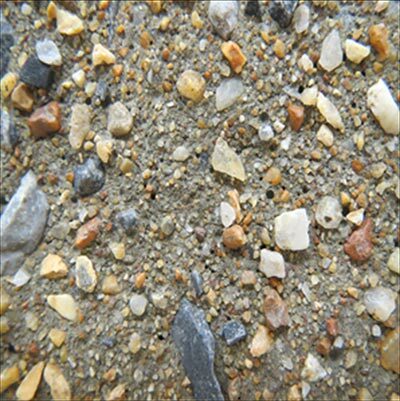 If a commercially available product, such as an in-form retarder, is specified to create an exposed aggregate finish, fabricators should follow the manufacturer’s recommendations for achieving the desired surface finish. 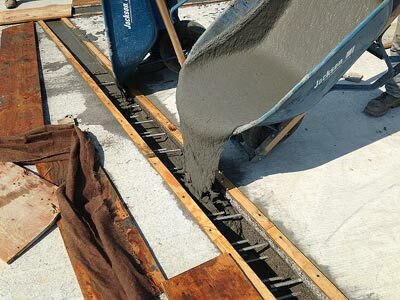 Removal of contaminants: The concrete substrate should be free of materials or substances (contaminants) that inhibit bond with connection grout materials. Contaminants should be removed prior to placing the connection grout materials. Contaminants that reduce bond strength include dust, dirt, grit, grease, and form-release agents. Pre-wetting connection interfaces: Based on enhanced tensile bond strength observed from research studies, concrete surfaces within the connection region should be pre-wetted prior to placing the field-cast grout material. Practice has shown that using wet burlap is a good way to provide moisture at the concrete-grout interface. Design and detailing of connections between prefabricated bridge elements is critical to achieving a functional, durable, and robust structural system. Cold joints between the prefabricated concrete elements and field-cast closure grouts are unavoidable and can result in premature cracking at the concrete-grout interface, which can reduce the system durability. This document provides insight into the different factors that influence bond between substrate concrete and field-cast connection grouts. Along with a detailed description of key factors, different test methods were discussed, and a set of recommended considerations for detailing and construction were presented. Culmo, M.P. (2009). Connection Details for Prefabricated Bridge Elements and Systems, Report No. FHWA-IF-09-010, Federal Highway Administration, Washington, DC. Silfwerbrand, J. (1990). “Concrete Bond in Repaired Bridge Decks.” Concrete International, 12(9), 61–66. Silfwerbrand, J. and Beushausen, H. (2005). “Bonded Concrete Overlays—Bond Strength Issues.” Proceedings, International Conference on Concrete Repair, Rehabilitation and Retrofitting, Cape Town, South Africa, 19–21. Bissonnette, B., Courard, L., Fowler, D.W., and Granju, J.L. (Eds.). (2011). Bonded Cement-Based Material Overlays for the Repair, the Lining or the Strengthening of Slabs or Pavements: State-of-the-Art Report of the RILEM Technical Committee 193-RLS, Volume 3, Springer Science & Business Media, Berlin, Germany. Wall, J.S. and Shrive, N.G. (1988). “Factors Affecting Bond Between New and Old Concrete.” ACI Materials Journal, 85(2) 117–125. Momayez, A., Ehsani, M.R., Ramezanianpour, A.A., and Rajaie, H. (2005). “Comparison of Methods for Evaluating Bond Strength Between Concrete Substrate and Repair Materials.” Cement and Concrete Research, 35(4), 748–757. ASTM C78. (2009). Standard Test Method for Flexural Strength of Concrete (Using Simple Beam with Third-Point Loading), ASTM International, West Conshohocken, PA.
Haber, Z.B., De la Varga, I.,and Graybeal, B.A. (2016). “Performance of Grouted Connections for Prefabricated Bridge Elements—Part II: Component-Level Investigation on Bond and Cracking.”2016 PCI Convention and National Bridge Conference,Nashville, TN. ASTM C496. (2011). Standard Test Method for Splitting Tensile Strength of Cylindrical Concrete Specimens, ASTM International, West Conshohocken, PA.
ASTM C882. (2013). 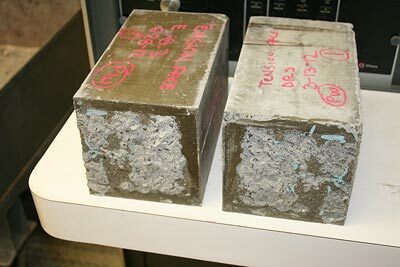 Standard Test Method for Bond Strength of Epoxy-Resin Systems Used with Concrete by Slant Shear, ASTM International, West Conshohocken, PA.
ASTM C39. (2015). Standard Test Method for Compressive Strength of Cylindrical Concrete Specimens, ASTM International, West Conshohocken, PA.
Robins, P.J. and Austin, S.A. (1995). “A Unified Failure Envelope from the Evaluation of Concrete Repair Bond Tests.” Magazine of Concrete Research, 47(170), 57–68. ASTM C1583. (2013). Standard Test Method for Tensile Strength of Concrete Surfaces and the Bond Strength or Tensile Strength of Concrete Repair and Overlay Materials by Direct Tension (Pull-off Method), ASTM International, West Conshohocken, PA.
Austin, S., Robins, P., and Pan, Y. (1995). “Tensile Bond Testing of Concrete Repairs.” Materials and Structures, 28(5), 249–259. Bissonnette, B., Vaysburd, A.M., and von Fay, K.F. (2012). 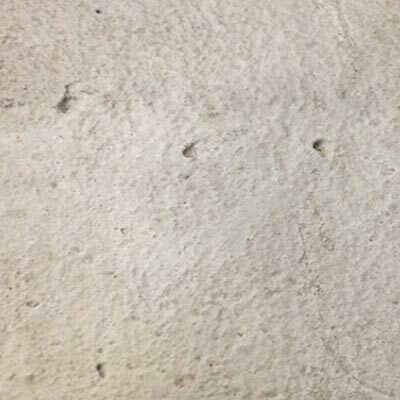 Best Practices for Preparing Concrete Surfaces Prior to Repairs and Overlays, Report No. MERL 12-17, U.S. Department of the Interior, Bureau of Reclamation, Technical Service Center, Denver, CO.
Courard L. et al. (2011). “Saturation Level of the Superficial Zone of Concrete and Adhesion of Repair Systems.” Construction and Building Materials, 25(5), 2488–2494. Mier, J.V. and Jan, G.M. (1997). Fracture Processes of Concrete: Assessment of Material Parameters for Fracture Models, CRC Press, Boca Raton, FL. De la Varga, I. and Graybeal, B.A. (2014). “Dimensional Stability of Grout-Type Materials Used as Connections between Prefabricated Concrete Elements.” Journal of Materials in Civil Engineering, 1107(9), 1–10. De la Varga, I., Castro, J., Bentz, D., and Weiss, J. (2012). “Application of Internal Curing for Mixtures Containing High Volumes of Fly Ash.” Cement and Concrete Composites, 34(9), 1001–1008. Fiebrich, M.H. (1994). “Influence of the Surface Roughness on the Adhesion Between Concrete and Gunite Mortars Overlays.” Proceedings of the 2nd Bolomey Workshop, Adherence of Young and Old Concrete, Unterengstringen, Switzerland, 107–114. Researchers—This document was prepared under the direction of Benjamin Graybeal at the FHWA Turner-Fairbank Highway Research Center. The document content was prepared by Igor De la Varga of SES Group & Associates, LLC, under laboratory support contract DTFH61-13-D-00007 and Zachary Haber of Genex Systems, LLC, under laboratory support contract DTFH61-16-D-00033. For additional information, contact Ben Graybeal at (202) 493-3122 or at the FHWA Office of Infrastructure Research and Development, 6300 Georgetown Pike, McLean, VA, 22101-2296. Key Words—Interface bond, cold joint, field-cast connections, bond strength, grout. Keywords: research, structures, Interface bond, cold joint, field-cast connections, bond strength, grout.